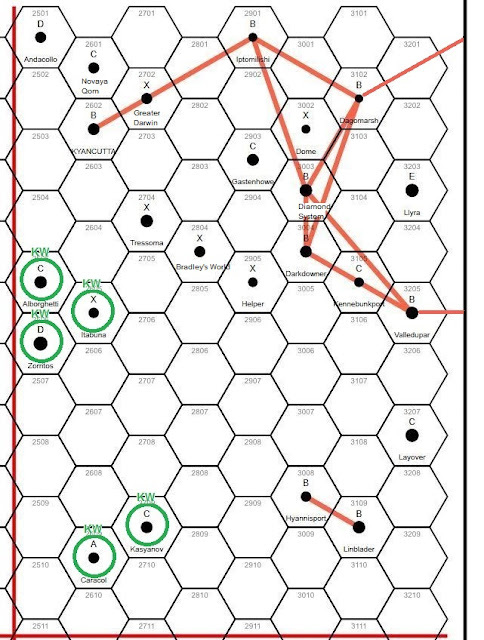 Okay so I am working on finishing all the subsector maps for the Kobra Worlds sector to be made into a little black book. In the Kyancutta Subsector, there are two major polities in this region, the Kobra Worlds Alliance and the Fourth Interstellar Union, both of which are vying for dominance in the area. Luckily, with its massive population, Kobra World is the 800lb gorilla in the room and is steadily advancing its colonization and uplift plans to maturation. The larger Union has tried (several times) to incorporate the Alliance into its sphere, but it just doesn't have the military power to do so; only a third of the Union worlds are in Kobra Sector, the rest in the adjacent Ivanhoe Sector. Kyancutta subsector is dominated by Union worlds, but several Kobra Worlds lay nearby. The high-population world Kyancutta is the subsector capital of this region. The Iptomil homeworld is also located here; for more information on them, click HERE.